Ha! It’s been a while since I’ve done a tech Thursday or given anything away. I figured with my recent post hitting the most views in a day (Eric and Heidi’s wedding sneak peek), I’d do a tech Thursday post (randomly connected I know) and give something away. I recently purchased a Canon 5D Mark III to replace my aging 5D Mark II. I love the Mark II. It’s been my go-to baby for the last 3 years. I’ve decided to keep it for as long as I can. In the mean time, the shutter is just about ready to go. So I thought shutter would be a good thing to talk about for tech Thursday. Pretty cool, right? Who knew the mirror bounced so much? Okay, lots of people did, hence why they have a mirror lock up function on cameras so you don’t create small vibrations in your camera that can mess up long exposure shots. If you watch closely you’ll see the shutter (curtain) drop down and then a second shutter (curtain) follow immediately. 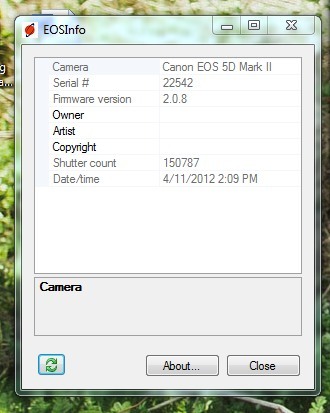 What that means is that the entire sensor on the camera is not “exposed” at a given time. Instead, it gets exposed from the top moving downwards (in actuality this translates to bottom of your picture to the top – images are actually taken upside… grab a lens and look through it. You’ll actually see that the image is upside down). However, this only occurs when the shutter speed is greater than the “sync” speed of the camera. At the sync speed, the camera sensor is completely exposed. There is no shutter in the way of the sensor. Anything slower than the sync speed, the shutter will not be in the way. What’s interesting (and makes sense) is that the sync speed is the max speed at which you can fire off your flash (minus using fancy E/I-TTL and hypersync blah blah blah) since this is the point that your sensor “sees” everything and light hits the sensor in its entirety. Sync speeds will vary from camera to camera. Most Canon camera’s are limited to about 1/200th of a second or 1/250th of a second. I think Nikon goes to 1/300th of a second or higher. Here is a good example of what happens when you try to take a picture above your camera’s sync speed. Because you are trying to take a shot faster than the sync speed, the second curtain starts to move before the entire sensor is exposed causing a black line to form. The faster your shutter speed, the more black you see. Fun, right? Luckily, most cameras will prevent you from exceeding your sync speed when you put the flash on the hotshoe and turn the flash on. Cameras are pretty smart. So here’s my contest. The Canon 5D Mark II has a shutter life of 150,000. That’s an average number of actuations before your shutter will fail. A screen shot below indicates I am at 150,787 which means that my shutter should be going out pretty soon… supposedly. There has been a report of a Canon 1D Mark II (200,000 actuation shutter life) that has made it to 4 million shots before failing. Yes, 4 million. Now, I doubt that my shutter will last as long. The contest is simple. Leave a facebook comment below with the number of actuations that my camera will make before it begins to fail (meaning I start seeing black lines from at the bottom of my pictures when I’m not using a flash) or just completely fails (shutter falls off or dies a gruesome death). The person that comes closest without going over will win a gift certificate for $50 to one (winner’s choice) of my three favorite places to buy camera gear from, B&H, Adorama, or Amazon. Contest entries can be placed between 6PM Eastern Standard Time Thursday April 12 to 11:59PM Eastern Standard Time Thursday April 19, 2012. If for some reason the shutter doesn’t give out by 11:59PM Eastern Standard Time on October 31, 2012, the person that guesses the number of actuations closest to the number of actuations on the camera on this date will win the prize. Oh, and you have to live in the US, can’t be related to me, and be over 18. In case you didn’t know, I, John Shim, am sponsoring this prize. By entering this contest, you agree to provide me with your legal name and address. The winner will be announced on my blog and facebook page (see below for facebook page) when my shutter dies or on November 1, 2012. I think that about covers most of the contest information. Good luck everyone!